Today, my guest is Dianne. Dianne is a wife, mother, grandmother, and founder of the Secrets Savored ministries. Secrets Savored is a discipleship ministry that provide tools and knowledge for women to confidently care for their home. Dianne leads weekly classes to provide practical tips and Godly wisdom for women. Single, engaged, and young married women have been highly impacted by her ministry. Dianne's husband, Mark was the associate pastor at our church when I was in high school and I continue to look up to them so very much. They are passionate about following the Lord and have been going through some very difficult trials and the last few years. Dianne has shown such grace, faithfulness to God through it all, and she is truly a one of a kind. I know you will be blessed by hearing from her. I know I was! 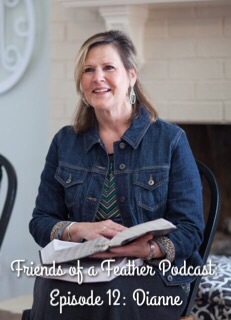 Be encouraged and share this episode with a friend! Remember, we are all Friends of a Feather...let's stick together!! Have a great day!! Find Dianne on social media! And, if you like what you hear, would you do me a favor? I would love if you would go to iTunes and review my podcast!